In 2005, Helen and I and our designated travelling companion, Jo, aka, Joanna, aka Jobi, aka Jobianna, found ourselves with a three day weekend and money available for a trip but with no specific designation in mind. Somehow Budapest, Hungary came up, and off we went. We took a budget airline, and all went well, and we took a taxi to our hotel, the Kempinski, a five-star establishment, beautifully located close to the river and next to a little square of lawn, trees and fountains called the “Ersebet ter”. I usually try to learn at least the basics of the language (“Sorry”, “Thank you”, “Please” etc) when we travel to non English-speaking countries, but when I tried to thank the cab driver in Hungarian he just laughed at me. Note to anyone going to Hungary, don’t even try to speak Hungarian unless you’ve studied it (or possibly unless you speak Finnish, as the two are closely related). It’s a very difficult language to learn, but there is no need, as everyone we dealt with during the entire trip spoke fluent English. 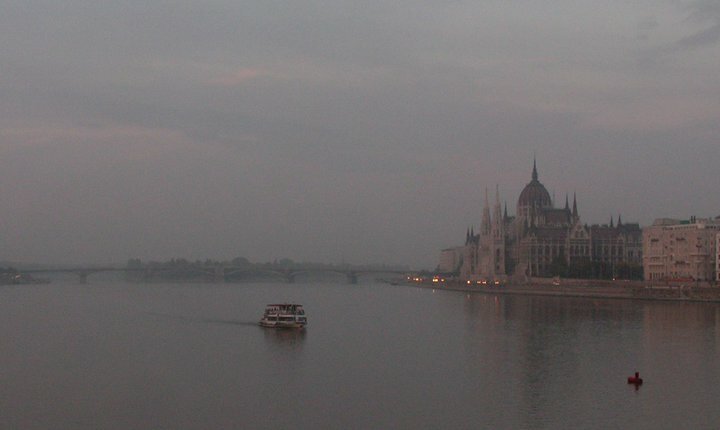 One of the first things we learned is that Budapest is actually two cities that merged. The hilly Buda is on the west side of the Danube, overlooking the more populous Pest across the river on the east. The hotel was properly accessible, with a roll-in shower complete with shower bench, but our room felt hot and stuffy. We couldn’t get the heat turned down, and when we tried to open the window there was an anti-suicide safety catch that prevented us from opening it any wider than a couple of inches. We called the front desk and they sent the maintenance guy up, and he unscrewed the catch and opened the window. And then he just stood there in our room. It took us a couple of minutes to realize that he wasn’t going to leave the room with the window open, so we reluctantly asked him to close it back up and he sealed us in and left. It was misty outside when we went out to eat, and it felt magical and very atmospheric, with a halo around each of the street lights. We found an accessible restaurant (“Muveszina’s”. Can be found on Google maps)) on the northeast corner across the square in front of our hotel, but the waiter told us they wouldn’t have a table for us for an hour or so. This seemed like a good opportunity for us to go find somewhere to have a drink. We walked along the very pleasant Andrassy Street (wide, smooth, tree-lined sidewalks) looking for a place to have a drink while we waited, and we passed a lot of bars and restaurants that had steps, with no ramps apparent. I have to apologize for this next bit, because upon recent research I have discovered that this establishment no longer exists. We did finally find a bar (“The Wall Street”) that looked inviting, even though it had a 6-inch step at the door. By then we were thirsty and didn’t feel like wandering around anymore so with a boost from Helen we were in. It was lovely, with high ceilings, wood furniture, a four-page drinks menu, attentive wait-staff and a very accomplished bartender. It was relaxing and nice, and I am saddened to know that it no longer exists, even if we never make it back to Budapest. Our dinner at Muveszina’s was very good, if a little salty. The next day we discovered that through sheer dumb luck, our schedule meant that our first full day in Budapest happened to be their National Memory day, (October 23), when the Hungarians observe the anniversary of the 1956 uprising which was subsequently crushed by the Soviets. The city was relatively quiet, with entire streets blocked off and displays of 1950’s era military hardware parked around the square by the river, and a band in period costume playing rebel songs from the back of a flatbed truck. We walked and rolled a short distance to the famous Chain Bridge; a beautiful suspension bridge with two big granite lions on either end that spans the Danube. The bridge was closed to motor traffic for the day and there were autumn leaves and rose petals scattered on the tarmac among some candles that gave a soft glow in the misty air. The bridge is accessible and easily crossed for wheelchairs, and there is a spectacular view of the parliament from halfway across the river if you take the pavement/sidewalk on the north side. There is a traffic circle/roundabout on the Buda side of the river when you get off the bridge, and this too was closed off to traffic and people were milling around eating sausages and bread and pretzels from the stands that had been set up. We walked through the big tunnel (about 50 meters) that leads into the city, and where there would normally have been two lanes of cars whizzing through, there were instead displays commemorating the uprising, with photos and text. I don’t read Hungarian any better than I speak it, so without any English translations we had to find the context ourselves. It was pretty self-explanatory, and I felt privileged to be there on such an important day for the Hungarians. When we came out of the other side of the tunnel there was a 1950s era green army vehicle parked in the road blocking the tunnel serving as both an impromptu roadblock and a piece of playground to the half dozen kids clambering over it. There were trees lining the road, and the buildings were scenic and old, but the sidewalk looked rough and the curb was unramped so we turned around and walked back through the tunnel. The sidewalk/pavement on the right hand side of the tunnel if the Chain Bridge is behind you is wide and smooth and easy to traverse in a wheelchair. We had dinner at a restaurant complete with gypsy violinist, and again, the food was just slightly oversalted. Our breakfast the next day was slightly oversalted as well. As a matter of fact, every single meal we had in Budapest was just slightly oversalted. Not terribly so; definitely not enough to complain to the staff, and it’s a minor complaint overall, but the cumulative effect was noticeable and by the time we left Budapest all three of us were feeling somewhat parched. After our too-salty breakfast we walked back over through the now busy streets and across the Chain Bridge again. It was open to motor vehicles, and the change in atmosphere from the day before was incredible, with clouds of blue exhaust filling the air and hundreds of little cars racketing by. The roundabout was a bit more of a challenge with little cars zooming around it, but the crosswalks are signalled and ramped, so it was doable. There is a “Funicular” (a tram that runs up a steep hill) with a terminus just past and to the left of the traffic circle thatr carries passengers up to the top of the steep hill, where the Buda Palace is. It is fully wheelchair accessible, and so we rode it up. I recommend this journey for the views, even though the square at the top of the hill is very roughly cobbled. We headed north from the square up a cobbled road and found a café serving coffee and beer with outdoor seating. There are quite a few of these establishments in the area, and if the weather is good and one can handle the cobblestones, it’s a nice way to spend an hour or so soaking up the atmosphere. The narrow cobbled streets and old buildings of Buda have a calmer, almost medieval feel to them, compared to the more imposing architecture of Pest. From the café we progressed further north to the Fisherman’s Bastion, which is a beautiful fortress of sorts made of white stone, with turrets and spires and an amazing view of the river and Pest. Most of it is easily accessed in a chair, although, again, the road getting up to it is cobbled. There is a slight incline upwards as one travels north from the Palace Square, but it’s not steep enough to be a problem. There is a huge white church with a very tall steeple in the square by the Bastion, but there was a long line of people waiting to get in neither Helen nor Jo nor I are big fans of churches, so we didn’t bother. We walked on beyond the Fisherman’s Bastion to the Vienna gate, and at this point I made a mistake which caused a slight problem. Jo and Helen wanted to find a cab, but I don’t like making transfers out of my chair unless I absolutely have to and I didn’t think we absolutely had to take a cab. I though we could just as easily continue on through the gate and go down and around to get back to the Chain Bridge. This was a big mistake, and if you are in a wheelchair, do not do this. We made it, but the road was dangerously steep without solid shoulders, and with the cars flashing past me just inches away I felt very unsafe. It would have been more dangerous and difficult to turn around and go back however, once we realized how steep the road was, so we continued on and made it back, but it got a little tense for a bit. I am sorry that I cannot give more details regarding the meals we had, but all of the restaurants that we patronized have either gone out of business or relocated. On our last day, Helen and Jo wanted us all to take a cruise on the river. There are dozens of tour operators offering what sounded like spectacular cruises up the Danube, but none of them were accessible for wheelchairs. It was pointless. We must have checked over a dozen before I gave up. Helen and I decided to go drown our disappointment drinking beer and writing postcards in the public square at the top of Vaci Street (a pedestrianized road lined with shops). It was a pleasant way to spend the afternoon. Overall, we enjoyed Budapest very much, and although we didn’t see everything (there is a large “People’s Park” that sounded interesting), we did absorb much of the atmosphere, and it felt as though a spending a long weekend was as much time as was needed to feel fulfilled. Our cab ride back to the airport was a little more adventurous than we had expected. See the video here (30 seconds long). In closing, I would definitely recommend Budapest as a holiday destination for wheelchair travellers, especially if one’s schedule is compatible with being in the city on October 23rd ( check the dates to be sure). This entry was posted on Wednesday, August 28th, 2013 at 9:34 pm	and tagged with Andrassy, Buda Castle, Budapest, Chain Bridge, Danube, Hungary, Kempinski, Muveszina's, Wheelchair and posted in Locations. You can follow any responses to this entry through the RSS 2.0 feed. Next time you go to Budapest please visit the http://www.paralimo.hu site and you can rent a paralimo.